Have you tried this shopping cart? I had a cart that my mother used to use when she did her grocery shopping - so I took it to Walmart today. I don't have a camera so can't post any picture - but wondered if anyone else has tried this cart. I thought it worked really well - they have them at Stacks and Stacks (http://www.stacksandstacks.com/kitchen-shopping-carts). Lots of other sites too of course. I like that the cart folds up and was easily pulled behind me - and it holds quite a bit of stuff. I didn't seem to be getting into anyone's way with it. I'm not sure exactly which one it is, but you can view their shopping carts by clicking here. Cynth, if you have updated information about your TrolleyBasket, this would be a great time to post it. How's the new one working out for you? 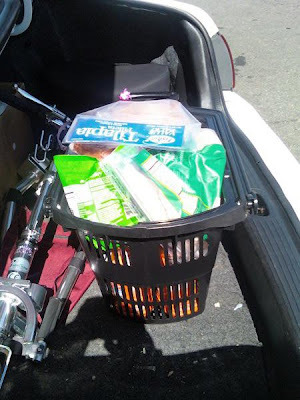 How do you all grocery shop when you're using your TravelScoot? I got out on my TravelScoot yesterday. Our grandson had a soccer game at the large countysports complex. Turned out his field was the furthest away from the parking lot. They have nice paved paths and it has some grades but with a running start I did just fine. Has anyone been to a high school football game with theirs? One of my nephews plays and he really wants me to come to a game. "I wanted to remind everyone that you do have to do some maintenance on the scooters. Both Sarge's and mine have had to be tightened with those little tool thingys Hardy gives you. Especially at the place where the pole goes up and down, that clamp comes loose and will slip out of the slot if not tightened and then you can't steer it. Just takes a moment, but do it okay?" I haven't experienced this yet, but I do finger-tighten various clamps from time to time. It's a minor adjustment and easy to do. Thanks for the tip, Bee! 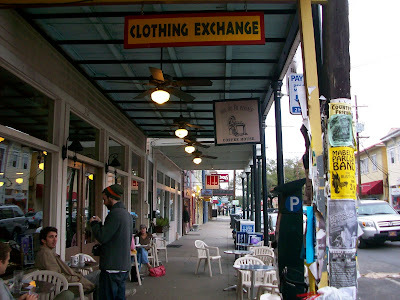 Peggy spent 4 hours on Magazine Street today trying out her new Travelscoot, Silver. She says it's the perfect place for a test run. "The oak trees provided lots of bumpy sidewalk. There were wheelchair slopes at each corner. They weren't really steep but it did help to have a running start. Magazine was more elevated in the middle so that the water could drain during a hard rain. Crossing it was like going up and down a very small hill. The best thing was that cars waited for you cross and some even stopped in order to cross. Every shop had a 1-2" lip or a step or 2 in order to get in. I had no problems lifting Silver to get him in. Several people offered to help. I explained that they could on my next trip but I was getting used to it. Once I got into a store I parked it and walked. It was perfect. No store owner objected to my parking it. Because there was a lot of fragile items, I didn't want to ride it around the store. One truck wanted to know if I wanted to race." Tomorrow she's planning on walking the dogs. I'm wondering if they'll be walking HER instead! This blog posts on my Facebook page, and there were several comments made there that you don't see here, so I thought I'd bring them over. Welcome to our funny scooter family, Peggy. or, given the horse imagery, our herd. I have a dog leash that I can fit around my waist and attach to my dog's collar so I can have her securely with me, but it is hands free. I did some training so that she doesn't get in front of the Scoot, especially when I am turning left. Dogs actually prefer to lope, so the pace of riding the Scoot, which is a bit faster than walking, will keep the dog's attention better than walking. Oh I have the CUTEST bicycle bell - guess I'll have to get that to Mrs. Fisher!! Oh Elizabeth!!! Awesome. I hope Peggy gets to do all those things and more! Peggy, if you (or anyone else reading this) would like to follow my blog via Facebook, just add me as a friend. You can search for me by using my email address -- elizabeth@ifisher.com . I don't add people I don't know, so send a message letting me know you're wanting to follow this blog. I was able to put the scooter up on the big screen in my classroom to show my students. They were so excited and ready for a field trip. I was telling them I needed to come up with a name for it. One of my students said to call it Silver. My assistant then said, "Hi, Ho, Silver, Away." That was it. Now all I need is a white hat and a mask! Let's see; walk the dogs in the neighborhood once I get their new harnesses, walk the dogs along the lakefront, walk the dogs on the St. Tammany Trace, go to the Quarter, go to Magazine St, walk the dogs in Audubon park, go to the zoo, go to the aquarium, go to the insectarium, go to Lakeside Shopping Center, Go to the Mall of Louisiana, go to the Destrehan Festival when it happens, go to Houmas House Festival, and did I mention walk the dogs. She thinks she may have worn herself out before she even gets Silver (arrival scheduled for Friday! ), and I agree with her, but I have a feeling she's going to have some adventures to share after this weekend. Stay tuned. Same Bat-time, same Bat-channel!" Oh wait, that's the wrong show. LOL! If you have a TravelScoot adventure to share, please send it to me at elizabeth@ifisher.com. Today Alan, Rhonda and I met our new friend Peggy at the Starbucks inside Target. She and her brother and sister-in-law drove to Baton Rouge from New Orleans to try out a TravelScoot. She was researching scooters online last Thursday, found the TravelScoot and then this blog, and realized it was a perfect fit for what she needs -- help walking longer distances. When Alan and I came through the door at Target, Peggy was right there on Rhonda's TravelScoot to meet us. She took to it immediately and before she left she understood how to fold and unfold, attach/remove the seat, and how to "Fred Flintstone" it! "I just heard from Hardy. I will call him tomorrow and pay ... and he said I should have my Rootin' Tooton' Boot Scootin' Scooter by FRIDAY." I suspect that Peggy will be having quite an adventure in New Orleans this weekend. I use the seat back about half of the time, but my Scoot is currently folded up in the trunk of my VW, so I can't measure it. Although it has a second setting where you can bring the back pad closer to the seat, I find the standard setting just fine. when I am driving, I am leaning lightly on it, but when I stop and relax, it allows me to shift my position and change the angle of my sitting, which allows me to sit longer. however the last two times I took it out, including a several hour visit to a county fair, I forgot the seat back and I really didn't mind. and when I was hauling my luggage around the airport and had the area between the seat and handlebars full, I could mount the Scoot like a horse because the seat back was safely tucked into my checked-in luggage. NEWS FLASH: Hardy Huber told me at the NAAFA Convention that the new larger seats are now in stock! I was looking at the manual; the seat back position is somewhat adjustable! There are two holes for the positioning 'peg' for the seatback attachment. He also details the bending of the vertical support to reach one's comfort level. Q. OK, should one decide to purchase a Travelscoot, how does one get it through the insurance companies? Is Mr. Hardy an "authorized medical dealer"? Is the internet site one? A. I've talked to Hardy Huber about this and neither he nor his internet site is an authorized medical dealer. You can read more blog posts about this topic by clicking here. If you work with your insurance company to get them to pay for it I would love to blog about your progress with it. You can email me posts by sending them to elizabeth@ifisher.com. Q. What is the most weight (person, not baggage) that this unit has carried? A. 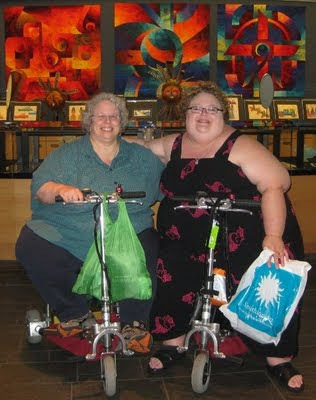 The highest weight person I know of who uses a TravelScoot regularly weighs 450 lbs. Q. 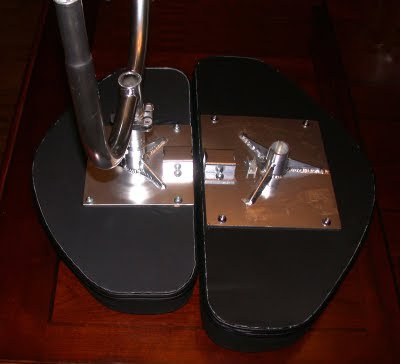 If the foot pegs are too close together can an adaption be made? A. I heard someone ask Hardy that at the NAAFA Convention and he recommended against it because changing the length of the foot pegs could change the pressure put on the upside down "U" piece that's mounted right over the front wheel and cause problems with the integrity of that piece. He used better terminology to describe what would happen, but hopefully you get the general idea. Q. I'm worried about the foot pegs. How far apart are they? A. I measured my TravelScoot this morning and the total width from end to end on the foot pegs is 15 3/4". The part where you put each foot is 4 1/2" wide. Q. What is the distance from the seat back to the handle bars. A. I don't use the seat back on mine, but I measured the distance between the handlebar pole and where I think the seat back would be and measured about 24". I don't use the seat back and I sit a little further back on the seat than I would with the seat back attached, but I carry a lot of my weight in my back and this is what's comfortable for me. 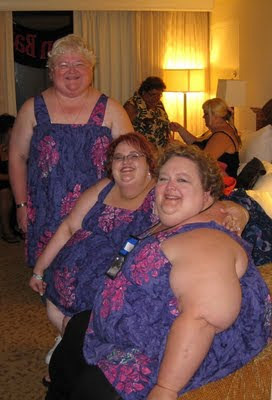 The focus of my workshop at the 2009 NAAFA Convention was on movement for supersize bodies. In the first part of the workshop we talked about exercise, both in group classes and with personal trainers. In the second part we talked about using scooters as mobility aids to expand our worlds. Melissa Waldron, who is certified to teach group fitness by the American Council on Exercise (the same folks who certify the skinny instructors), and who is also a supersize woman, led us in a yoga demonstration. Melicia Lemoine talked about her experiences with a personal trainer. Melissa emphasized that it's possible to modify many classes, especially water aerobics, to work for people of all sizes. here to hear the other side. I began using a scooter to shop at the grocery store a few years ago. see me and I'd just die of embarassment. Well, someone did see me. She told me later that when she saw me she wanted to run and hide. I went on to tell them about buying my first scooter, a Rascal 235, off eBay, and the problems we had transporting it. I was searching the internet for regulations about taking that scooter on a plane when a Google search led me to Hardy Huber's TravelScoot website. Rhonda and Lynn Ellen shared their experiences and answered questions from the audience. Hardy Huber, the TravelScoot inventor, gave us a demonstration on preparing a scoot to be stored on an airplane. I wish I had wonderful things to tell you about what Rhonda, Lynn Ellen and Hardy said, but the only reason I remember what I said was because I had my notes written out in advance. I can tell you that we closed the workshop with mass chaos as we took everyone out in the hall and let them ride our TravelScoots. I saw a lot of smiling faces zooming down that hallway. The response was just overwhelmingly positive. I was barely in the hotel for the NAAFA Convention before I started getting questions about my TravelScoot. It's all pretty much a blur now, but it was hard to go ten feet without getting stopped for questions. For my workshop on Friday afternoon there were 50+ people in the audience. I am certain the majority of the people attending the convention -- and some who were just staying in the hotel -- rode one of the five TravelScoots that were there, whether they needed a scooter or not. Hardy Huber brought his personal scoot and one more to use as a demo model. Anyone who bought one had it shipped to them. Cynth asked me if there were people there who were as excited about the TravelScoot as we are, and I think there were. Since buying any scooter is a big purchase, I'm sure that some people who wanted to buy them had to go home and figure out how to work it into their budget. It will be interesting to see how many TravelScoots are at next year's convention, which, if you're curious, is going to be in San Francisco. One lady (who follows this blog) and her husband drove to the hotel to buy a TravelScoot. It was wonderful to meet them and spend time talking to them. There are just so many genuinely nice people in the world. She's promised us a picture of an adventure. People asked a lot about the differences in the batteries, if you could ride it in the rain (light rain - yes) or snow (no), if Rhonda was being paid to constantly ride through the hotel on hers (no), if I'd ever flipped mine or fallen off (no and no), if it was as much fun as it looks (yes! ), how much does it cost (about $1400-$1900, depending on the battery), how does it work at the airport (great! ), any problems with airport security (no, but they swabbed it both times it went through security), and how does it fold/unfold? Thank goodness for Alan, because there are only so many times I am willing to fold and unfold it. There were lots of people at the convention using standard mobility scooters, some were rented and some owned. The standard mobility scooters and the TravelScoot each have their own advantages and disadvantages. For someone who owns a traditional scooter, I could still see them having a TravelScoot for when they need their scoot to be the most portable. To make a standard scooter really useable for most people, you need a lift and a vehicle that will accommodate that lift. Hopefully others who were at the convention will post comments about the questions they were asked or questions they heard asked. They may even have some good stories to share. I know this isn't a TravelScoot picture, but I used my scoot to ride to Big on Batik's vendor room! The woman standing up is my sister Kay, who had many adventures on Rhonda's TravelScoot at the convention, and my friend Melicia is sitting next to me. We were in full shopping mode. Big on Batik is where I buy almost all my clothes. The batik fabrics are beautiful, they're very cool, and the colors don't fade even after many washings. I even dry mine on a very low heat. Dianne, a Facebook friend, has been asking me about the TravelScoot. Others reading this blog probably have these same questions, so I thought I'd answer them here. 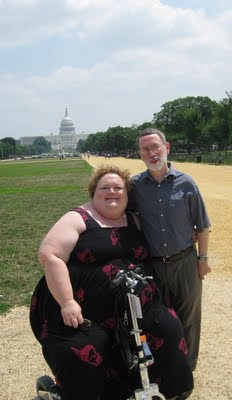 This happy picture is of Lynn Ellen and me in Washington, D.C. It truly would not have been possible for either of us without our TravelScoots. We had just left the Air and Space Museum and were on our way to the Natural History Museum. Q. Got any info on the TravelScoot? Like weight limits etc.? A. The published weight limit on the TravelScoot website is 320 lbs., but people up to 450 lbs. are using them. I've had mine for 6 months and Hardy Huber, the TravelScoot inventor, recently examined mine and saw no structural signs of wear. That is great news for larger riders. Q. I WANT ONE...but I'm worried about the foot pegs. How far apart are they? A. I'll have to measure it tomorrow and let you know. I was concerned about the distance too when I first saw the TravelScoot but it hasn't been a problem for me. Whenever I'm not moving on my TravelScoot I put my feet down on the ground, which I like better than the traditional scooters where your feet can't touch the ground. Q. Anywhere I can "try one on?" A. If you're anywhere near Baton Rouge, LA, you can try mine. They're not sold in stores that I'm aware of. You can go to TravelScoot.com and contact Hardy Huber to find out if there's anywhere else you can try one out. A. I prefer using mine without the seat back so I don't know this measurement. What my experience has been with riders from 250 - 450 lbs is that if the seat back isn't on it, the rider sits further front or back, and everyone ends up being about the same distance from the handlebars. Dianne also wrote to tell me she called a local store to see if they had the TravelScoot and they told her yes. When she got there they told her they'd never heard of that one. Dianne, if you'll email me (elizabeth@ifisher.com) I'll talk with you privately about how it might fit you. 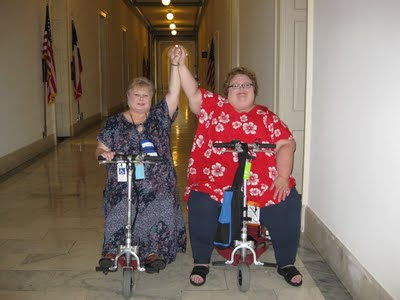 This picture is of Rhonda wandering down the halls of congress in Washington, DC on her TravelScoot. We were headed to talk to someone in our representative's office about size discrimination and health care. My name is Rhonda P. and I accost people on scooters in grocery stores to tell them about the TravelScoot. I just met a lady in Winn Dixie who was riding a store scooter (didn't know our Winn Dixie had those) and stopped her to tell her about the TravelScoot. I'm not sure why I did it but somehow knew she would want to know. She told me that she is about to have back surgery but does not want a big scooter. She said her husband who died a couple of years ago used a mobility scooter and it was a big problem. They had to buy a van and she had to be the one to take it apart and put it together whenever they went anywhere. I was about to leave and she was just getting started so I gave her your card and my name and phone number and told her to call and I would meet her at Target. She said she would also check out the blog. I hope we hear from her. She would probably also enjoy our Women of Size water class. Rhonda and I use Target as a testing ground for folks who want to try the TravelScoot. We can sit in Starbucks and visit while they're enjoying trying out the TravelScoot in a store with nice wide aisles and lots of fun stuff to shop for. 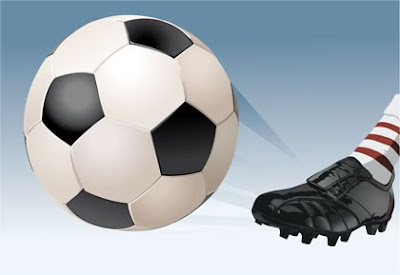 To follow this blog on Facebook you'll need to be my Facebook friend. You can search for me by using my email address, elizabeth@ifisher.com. Please let me know why you're adding me as a friend, so I don't ignore your invitation. I love this picture because it represents an experience I wouldn't have had without my TravelScoot. The hotel we stayed at was about 45 minutes from Washington, DC by car. We didn't need a special handicap van to transport it, because we could put it in the back of the SUV we rode in. We could even have folded it up and put it in a VW bug if that's what we'd been riding in. When we rode the hotel shuttle from the airport to the hotel, the driver loaded it fully assembled in the luggage area. My friend Melicia even pointed out that I'm getting a tan, something I haven't had in years. No surprise given that I've had more adventures outside in the past 6 months than I've had in the past 6 years. Another thing I learned while we were on vacation is that buildings that are "handicap accessible" may not work for me on my TravelScoot. 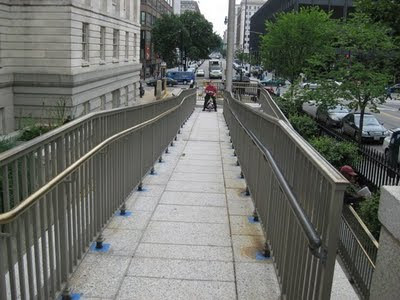 This is the handicap entrance ramp at the Smithsonian American Art Museum in Washington, DC. Rhonda and Lynn Ellen could probably have made it up this ramp just fine on their TravelScoots, but I couldn't, so Alan rode my TravelScoot and I walked. I have to say that any effort it would have taken to get into this museum would have been worth it. I could have spent days here, and I will go back the next time I'm in DC. My recent trip to Washington, DC was the first time I'd gone anywhere on wheels or had the adventure of taking my TravelScoot into so many different bathrooms. I even had a "country come to town" moment in a bathroom at Madame Tussands. I found that different places (airports, hotels, museums) have different ways of handling handicap restroom access, and sometimes you'll see it done multiple ways in different parts of the same building. There is either a handicap stall in the wo/men's bathroom, or there is one separate handicap accessible bathroom for use by both sexes. These are sometimes labeled as companion bathrooms. Sometimes when there was a companion bathroom my husband and I would go in together. I'd gotten so accustomed to this routine that when we were in Madame Tussands and looking for a restroom, I saw one that had a picture on it of a baby, a man, and a handicap symbol. I don't know what came over me, but my brain processed that and said it was okay for me to go in there because it was a handicap bathroom. Alan followed behind me. Imagine my surprise when I saw a row of urinals and realized I was in the men's room. Maybe I've led a sheltered life, but I've never been in a men's room before, and once I got over my shock and realized no one else was in there it was pretty funny. 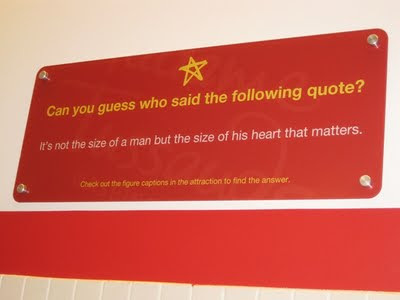 I even took a picture of a sign on the wall over the urinals that said, "It's not the size of a man but the size of his heart that matters." Ladies, think about what the signs say in the women's room. I think we're being cheated! Today I learned how to upload videos to You Tube. Click the link below to watch Rhonda showing off her TravelScoot during the Fashion Show for the 2009 NAAFA Convention. Your post on riding the TravelScoot at work really struck home with me. I was afraid to ride mine at work too. I am easily the fattest person where I work. I was worried that people would think "well she finally got too fat to walk". For a few moments I think that every time I have to ride the scoot at work. If I was able, I would still walk to the main building on campus. But I am not able to walk that far and haven't been able to for several years. I have broke out the scoot 3 or 4 times at work now and it gets a little better each time. The last time I had to go over to hear a presentation on some software we have started using... after the presentation I rode the scoot all over the IT section of our main building. They had remodeled it and all the people I used to be housed with are over there. I rode around and everyone saw me and it felt like I had finally told my big secret to everyone. I felt a little better after that. Cynth, I really identify with your feelings. I have a knot in my stomach just from reading your post. Today was my third day to ride it at work. It's getting easier, and I sure love how quickly I can make the trip to the bathroom, which is all the way across the building. I was also able to make a run to the coke machine to get a drink for a coworker who couldn't leave her desk. This post is from an email Rhonda sent me. She also went to the NAAFA Convention in Washington, D.C., but was on a different flight than I was on. I just read your blog post. Your experience traveling with your TravelScoot sounds a lot like mine. Baton Rouge to D.C. on Continental went smooth, in fact, it sounds like a carbon copy of your trip only without Squeak (the scooter "specialist" at the Dallas airport). D.C. to Baton Rouge on American Airlines started out okay in D.C. and ended okay in Baton Rouge. My problem was in Dallas, where the staff arbitrarily decided they would rather send my scoot directly to my next plane instead of giving it to me to ride to my connecting flight. (My TravelScoot actually never left the side of the plane during all of our conversations.) When I objected and asked them to give me my scoot to ride to my connecting flight, they would not change their mind. It became a battle of the wills when it really didn't need to be. Dallas was also the only place that the American Airlines staff decided to reassemble my scoot, instead of delivering it to me like I left it with them, using the travel bag and following Hardy's instructions. I hate to think what would have happened to my scoot had I let them have their way. I came away feeling like the day was a disaster when, in fact, it was only the employees at one gate that were the problem. I received a call today from AA and they have located my missing handlebar bag and are sending it to me. What's the weight limit on the TravelScoot? Q. I looked up the info on line about the TravelScoot, and they look interesting. My question is about the weight limit. It says that the weight limit is #320 - did you and the others get them customized - or are you riding that #320 TravelScoot? A. On the TravelScoot.com website the weight capacity is shown as 320 lbs. Yes, this is the same scooter I have. Mine is not customized. I talked to Hardy Huber at the NAAFA Convention and he's considering this a test phase right now. I've had my scoot since February, which is longer than any other supersize person has had theirs. Somewhere on his website it says that he set that weight limit based on the distance between the seat back and the handlebars, not on the capacity of the aircraft-grade aluminum frame. I regularly carry between 450-500 lbs on my scoot. There are some limitations at a higher weight, which I've written about on this blog, but they primarily deal with ramps and battery life. Q. I weigh about #370-380, so would it work for me? A. Yes, it will hold your weight just fine. Q. Also - are the seats comfy? They look fabulous! A. As Hardy says on the TravelScoot.com website, they're about as comfortable as a good quality dining table chair. I find it very comfortable, but it's not a seat I'd want to sit on for hours. It's intended for going the distance, and then you'll probably want to get off and sit in a regular chair. I do sit on it comfortably when there is no armless seating available. In the picture you'll see the Louisiana contingency meeting with Congressman Cassidy's assistant. 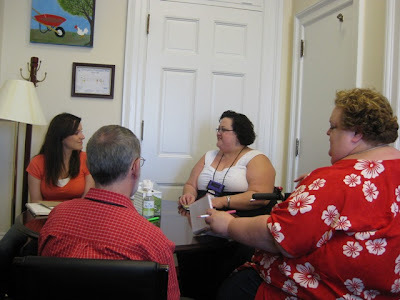 There were 7 of us in the room, talking with her about size discrimination and health care. For this meeting I stayed on my scoot. Before you read this post please keep in mind that the problems I experienced at the hotel and in Washington, D.C. only happened to me. The other TravelScoot owners (Hardy, Rhonda, and Lynn Ellen), did NOT have these problems. They all carry less weight on their scooters than I do. With me, the batteries and whatever I was carrying at the time, I estimate that my scoot was carrying between 475-500 lbs. If you're wondering if I would do it all over again, knowing what I know now, the answer is YES, ABSOLUTELY! 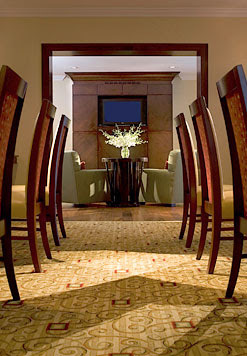 The picture to the left is from the Dulles Marriott website. This gives you an idea of what the carpet looked like. I had problems with my TravelScoot at the Dulles Marriott hotel, and it was because of the carpet. It was an exceptionally thick pile carpet, because I could feel the drag when I was riding on it. The drag wasn't a problem particularly, but what the drag caused was a stress on the motor and battery. Hardy, Rhonda, and Lynn Ellen felt the drag the carpet created too, but it didn't cause their motors to overheat or their batteries to overload. They could feel the difference because they know how it normally feels. The dozens and DOZENS of people who tried our TravelScoots didn't realize anything was different. Our hotel room was at the end of a LONG carpeted hallway, and the meeting rooms were all along another long carpeted hallway. I had my sla battery and my l-ion battery stacked. If I used the l-ion battery and rode from the room to the meeting rooms, sometimes the l-ion battery would overload somewhere along the way. If I used the sla battery instead, which does not overload, I could go further, but then the motor might overheat. BATTERY OVERLOAD - Scoot won't go, and no lights are lit on the battery panel. The SLA battery will not overload. When the l-ion battery overloads, it switches off and you lose power. You won't see any battery lights on the panel near the throttle. There are 3 ways to fix an overloaded battery. 1) If you were going up an incline when it overloaded, turn around and go back down the incline. Stay on the scoot and give it a good shove off with your a foot (or feet). You'll see the battery light come on as red and then when it goes to green you are back in business. 2) You can also plug the battery into the charger and that will reset the battery. If the motor overheats you will still see a green light on the battery panel. If you're brave (or stupid, take your pick) and TOUCH the motor casing, it's going to be very hot. Sit still for a few minutes and try the throttle again and you'll be on your way. When the battery starts getting low on power you'll see the light go from green to amber. When it stays amber that's your cue that you need to get somewhere where you can charge the battery or switch batteries. When it goes to red just picture the robot from Lost in Space saying, "Danger, Will Robinson, Danger!" Hardy says you have about a half mile left once you go to amber, if you weigh 180 lbs. We went into D.C. three times. Twice for sightseeing, and a third time to go to "the hill" to meet with our Congressman's representative. These three days all involved navigating many ramps and hilly areas and I had many times when either my battery overloaded or the motor overheated. In an ideal world I would have gotten off my scoot every time I came to a ramp or uphill climb, but that's not really practical in D.C. Lynn Ellen went with us the second day and she didn't have any battery or motor problems. I really believe that once you get to a certain point, every pound makes a difference. I also had the SLA battery on it which added another 20 lbs. If you're wondering why I didn't just use the SLA battery the whole time, it's because it would have run out of power. Usually by the time we got back to the hotel I didn't have a lot of battery power left in either battery. We would either go back to the room and charge the battery or we'd plug it up in one of the meeting rooms or a restaurant. As you can see in the picture, I have two carry on bags on the handlebars of my TravelScoot. If I had that to do all over again I would have gotten a small rolling suitcase that I could have fit under my legs, and packed absolutely everything I could in my checked baggage. I would have even paid the $25 for a second bag in order to do that. At my size every pound can affect how the TravelScoot handles inclines. As far as I know Rhonda and Lynn Ellen did not have the same problems I had, so when you are reading this, keep in mind that with 26 pounds of battery, me, and two weighty carry ons, I had between 475-500 lbs on my scoot. Which airport I was in when is just a blur, so I'm going to talk in generalities. When I was on a flat surface the scoot performed beautifully, as it did going down ramps. (Can we say wheeeeeeee!!!!!) When we moved into a train to go through an airport or changed from one surface to another (like where the plane connects to the ramp, or the ramp to the airport), most of the time it handled the bump well, but sometimes it would bump pretty hard. I started the day out with a fully charged sla battery and a fully charged l-ion battery. By the time we made it through three airports and got to our hotel room, both needed recharging. I didn't begin using my scoot until we got to the New Orleans airport. We were very early for our flight so I did ride around the airport more than was required to get to the plane. In Dallas I rode it again, then made a long trek with it at the Dulles Airport to get to the place where we caught the shuttle bus. A good bit of this time I was also pulling my big suitcase on wheels. The good news is that it was easy to put the scoot on the shuttle from the airport to the hotel. They didn't even have to fold it to store it. If you can think of specific questions I haven't answered, please feel free to ask. NEW ORLEANS to WASHINGTON, D.C.
2) Dallas: When we exited the plane, my scoot wasn't at the door of the plane. They had left it inside the airport at the door of the ramp to the plane. This was the only time this happened. When I went to get another gate check tag to reboard in Dallas, they cheerfully told me that they have a scooter expert named Squeak, and she would be right there to help me. She showed up immediately, walked to the door of the plane with me, then rode my scoot to the magical place they take them to put them on the plane. One of my friends who was flying with us told me she saw Squeak taking it on a test drive. It think it was the first time she'd seen a TravelScoot. This time we did not drop the handlebars or store the battery, because Squeak wanted to drive it to its destination. 3) Dulles: When we exited the plane my scoot was at the door of the plane. There are constant inclines from the plane to the airport building, and it wouldn't make it up the inclines with me so Alan rode it and I walked. The TravelScoot wouldn't handle the inclines because of my weight. 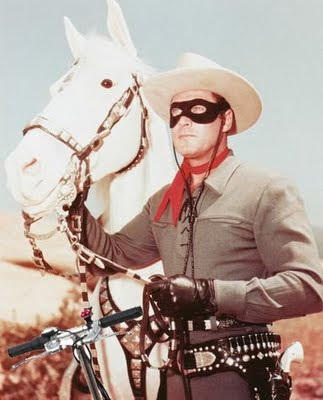 As far as I know Rhonda didn't have any problems riding hers up the inclines. 4) Dulles: We checked in at the kiosk, and then dropped off our luggage. At security I got off the TravelScoot and walked through the security check. They swabbed my scoot. I continued on to the gate where I asked for a gate check tag, which only took a minute to issue. Our whole party of 5 pre-boarded the plane this time. We think this happened because Melissa and I were wearing the same dress, because a staff member asked her if she was with me and sent her to pre-board. (Wearing the same dress was an accident, but ended up being a good thing.) I rode my scoot to the door of the plane, where we lowered the handlebars and put the l-ion battery in the storage bag and left the sla battery attached. 5) Dallas: We had a weather delay when leaving Dulles so we arrived late to Dallas and we were afraid we were going to miss our connecting flight. We have a whole row of seats across the airplane. Greg and Melissa were sitting on one side of the aisle, and Melicia, Alan and I were on the other. Normally we wait and get off last, but this time Melicia raised the arm on the aisle seat and as soon as she could stand up she did, effectively blocking anyone from passing. (And who says their aren't benefits to being a big girl?) We moved off the plane faster than we ever have. My scoot wasn't at the door of the plane and they told us to check right inside the airport. Alan ran ahead to get it set up for me. At that moment Melicia and I heard one of the employees saying, "it looks like a little motorcycle..." and we knew it was my scoot. I started pulling it up the ramp, hoping Alan would come back to rescue me. It's hard enough for me to walk the incline of the ramp, and harder when I'm pulling a scoot. I didn't know it at the time but he was trying to come back and the staff wouldn't let him. If I hadn't showed up quickly he would have pitched a fit about it. About halfway there I tried riding it and was able to get it up the final incline. From there we took off at as fast a clip as we could go and made our connecting flight. We got there just in time for Squeak to tag my scoot again and walk with me to the door of the plane where she took it and rode it to have it put on the plane. Whew! Oh wait, maybe this was where we all got to pre-board. It's all a big blur now. 6) New Orleans: My scoot wasn't at the plane when we got off. We walked the ramp to the airport and I sat down and waited until they delivered it to us, which was only a minute or two later. I am pondering if it can be said that every sort of coming out involves the tension between revealing one's truth to the world and to ourselves. When we come out to the world, we risk the possible negative attitudes of those around us, some of which may be known, other attitudes may be buried deep. But when we come out to ourselves, we face the deeply-seated attitudes that we have internalized or introjected from the world around us, and again we might find that there are feelings buried so deep we only discover them as we walk through the flames of the act of coming out. Fortunately, the fears are usually before and during the moments of taking that walk, because the relief of expressing our truths, of embodying our real selves is a welcome gift. But each new encounter can involve a new coming out, but hopefully we can move through that initial anxiety more swiftly and with less of a roller coaster of anxiety each time. The picture is of Lynn Ellen and me at the National Museum of the American Indian in Washington, D.C. It's a wonderful museum and well worth the time it takes to visit. If you go be sure and watch the film. It's only 13 minutes long and very informative. It displays on a 4-sided screen and on the dome ceiling. "How can you stand in front of all those people at your workshop and ask them to face their fears if you haven't faced your own?" I've got a lot to post from my trip to Washington, D.C. but first I need to back up and talk about what happened before the trip. We've talked some about the stigma of scooter use, and for me personally, my biggest hurdle was the thought of using it at work. I work on a campus with a 4-story building, and another building attached by a breezeway. The thinking side of me knows that my scooter use is protected under the same ADA regulations that wheelchair users have, but in the 12 years I've worked here I've never seen another employee using wheels of any sort (scoot or wheelchair). Over the last few years I've been limiting my walking at work to the bathroom and other "have to go" places. Seeing how much my scoot has enhanced the rest of my life (and spared me a lot of painful walking), I knew it would do the same thing at work, but I wasn't ready to face it. 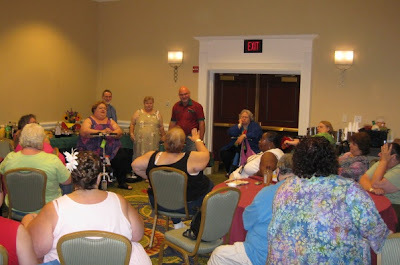 Until, that is, Rhonda asked me how I could give my workshop at the NAAFA Convention and ask others to face their fears about scooter use when I hadn't faced my own. The Monday before my vacation started I went for some lab work before work. I used my scoot for the first time at the lab, and it made everything so much less stressful. I wasn't worried about finding a parking place, or an armless chair in the waiting area, or about fitting into the chair where they draw blood. I just stayed on my scoot. When I finished there I loaded my scoot in my car and found a quiet spot where I could stop and think. Rhonda was right, and I knew it. In a moment of reckoning, I knew there was no day like today to face my fears. I drove back to my office and unloaded my scoot, hoping no one would see and I could just sneak into my office. Ha! A coworker met me at the door of the building, and another one joined us in the hall, then another and another and another. EVERY reaction was positive. I spent a good part of the rest of the day talking with coworkers about my TravelScoot. I'm really glad I faced my fears, not just so I could stand at my workshop and ask others to face their fears, but because I have a coworker with heart trouble and she's having an increasing difficult time walking distances. She'd never seen anything like the TravelScoot before, and suddenly she had found something she didn't even know she was looking for. Your fears may be different than mine. You might never have ridden a scooter at all and are afraid to even try one at Walmart. Or maybe you need one and you're afraid of what your family will say. Perhaps you've been staying home when you could be out enjoying yourself, doing your own grocery shopping, or going to work instead of staying home on a bad walking day. Whatever your fear is, please know that you're not alone, and facing your fear ultimately leads to enhancing your life. There is such freedom in being able to move quickly from place to place without pain, or without triggering an asthma attack, or in saving your strength not for the distance, but for the activity you've set off to accomplish and enjoy.